Well, nothing else going on here. Just enjoying a quiet morning. :) Write later! Nicole the bunnies are really cute! I use that pattern quite often for the bunnies in my round robins. I put one in the border with a carrot next to my name on Heather's round robin. Great progress on LHN! It is looking great! This will soon be ready for your tub too! You are amazing and the bunnies are sweet additions! 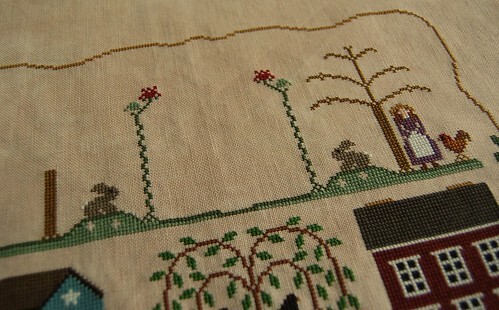 I am always amazed by how quickly you stitch. It is looking wonderful. The bunnies were a perfect substitution! Great job! A lovely 'unique' piece. The bunnies work so well. Love the bunnies! So cute! Looks great Nicole - cute bunnies! It must cost you a fortune in framing as you stitch so fast! The bunnies look terrific, Nicole! Just beautiful and the bunnies fit in perfectly! You're making great progress! The bunnies add the perfect touch. So cute! The bunnies are perfect - great choice!